The prolific American cellist Fred Lonberg-Holm has always been particularly diverse in his selection of projects and collaborations. A member of the Vandermark 5 and Brotzmann's Chicago Tentet he also occasionally leads his excellent Lightbox Orchestra and has more than 60 releases to his name since the early nineties. He's also left his mark on Chicago's indie music scene working and playing with the likes of Jim O'Rourke, The Flying Luttenbachers, and Wilco. This terrific collection from Corbett vs. Dempsy finds the maestro in Florida's Everglades National Park, where his performance and surroundings were recorded by renowned composer Gustavo Matamoros as a part of Lonberg-Holm's January 2016 artists residency at the Audiotheque in Miami Beach, FL. The liner notes state that Matamoros regularly records the soundscapes of this Southern Florida locale for use in his own artistic practice, and his participation on this recording helps brings the writhing melodrama of the Everglades to the fore. The title of this collection alludes to a direction in the score of Iannis Xanakis' "Kottos", where the cellist is instructed to "Bow Hard at the Frog", meaning quite literally to play vigorously at the frog (of the bow). In the context of this recording however the phrase becomes multifaceted, as Lonberg-Holm attempts to engage the amphibious wildlife of the Everglades in dialogue. The tracks are labeled either "NEAR" or "FAR" and are given an index (e.g. FAR1, the first track). I presume that they indicate the location of the microphones with relation to Lonberg-Holm and the order in which the tracks were recorded. The field recording expertise imparted to this project by Matamoros cannot be understated. The night air is filled with the sound of creatures, from high pitched chirps and veiled cricket bows to trombone like groans and abrupt buzzing noises; the native nighttime banter is captured in dizzying fidelity. Lonberg-Holm's approach to this experiment varies; his playing runs the gamut between texture and dynamics. Sometimes he gives his collaborators time to react between brief, moderately played statements; at other times his cello creaks and wails deafeningly for extended periods followed by irregular silences. This affects the wildlife bander in a variety of ways (it's hard to discern if the phenomena is real or a projection), but in general the faunae, particularly the amphibians, certainly take note of the alien sounds and sometimes even seem to take an interest. The album really shines in the silences between Lonberg-Holm's most violent outbursts, where we can hear the replies of native animals to this strange intrusion. The reactions range from careful, tentative silence to an excited clamor replete with highly animated croaks and grunts. I've played this release multiple times using both cheap car speakers and high-end head phones and it holds up well wither way, though I'm certain that this would be a revelation to hear in surround. Lonberg-Holm's playing on the record, whether intentional or not, invokes another direction from "Kottos" where Xenakis instructs that it "not be beautiful or nice in the usual sense, but rough, harsh and full of noise." To his credit the cellist espouses Xenakis' appeal to discord, as his playing contains plenty of noise and plenty of harshness, but it is very nicely counter-balanced by the surrounding ambient noises and frog song. And even though it's a futile exercise, it's amusing to envisage what the frogs might be deliberating after some of the brasher playing. The album also speaks to the theme of communication, and what part sound might play in transmitting meaning between distinct and subjective experiences. 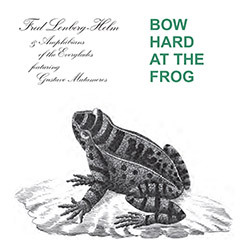 A record of stillness and sudden contrasts, Bow Hard at the Frog makes for a unique and wonderful listen.